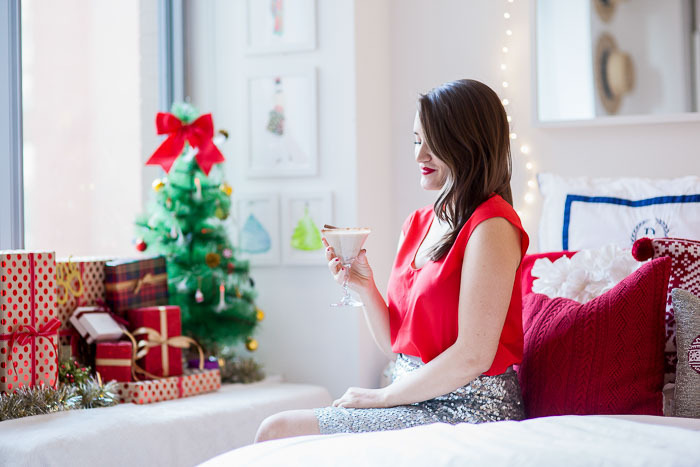 With the holidays quickly approaching, it's time to put on your best hostess pants (in my case, skirt) and invite everyone over to celebrate! 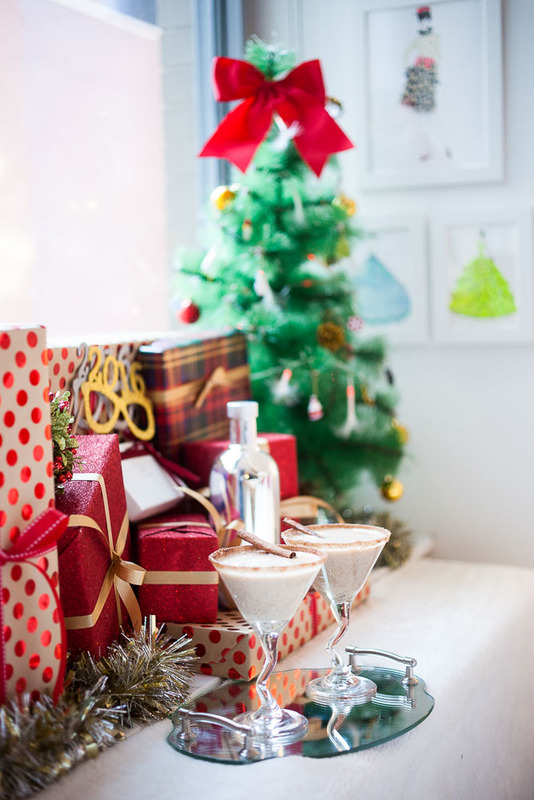 To get you ready for the fun day, I've curated three really fun holiday drinks for you and your guests to enjoy. 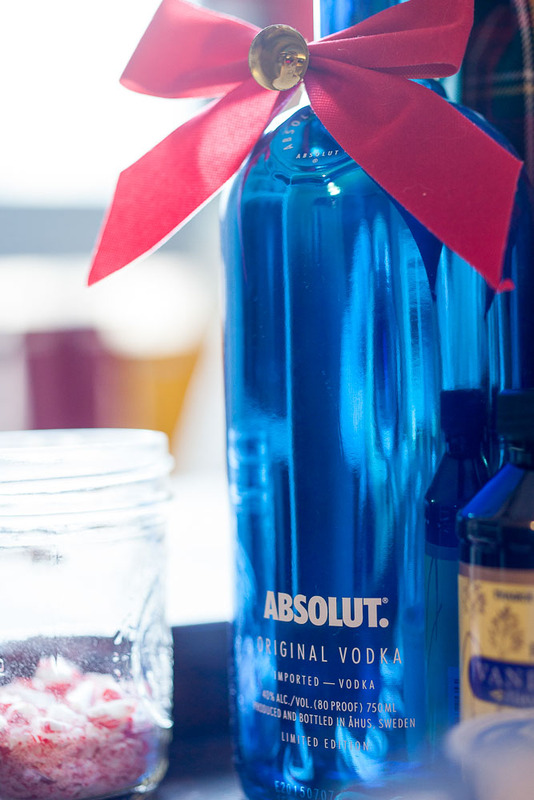 All are super easy to make and you only need one type of alcohol: Absolut vodka! What could be better? 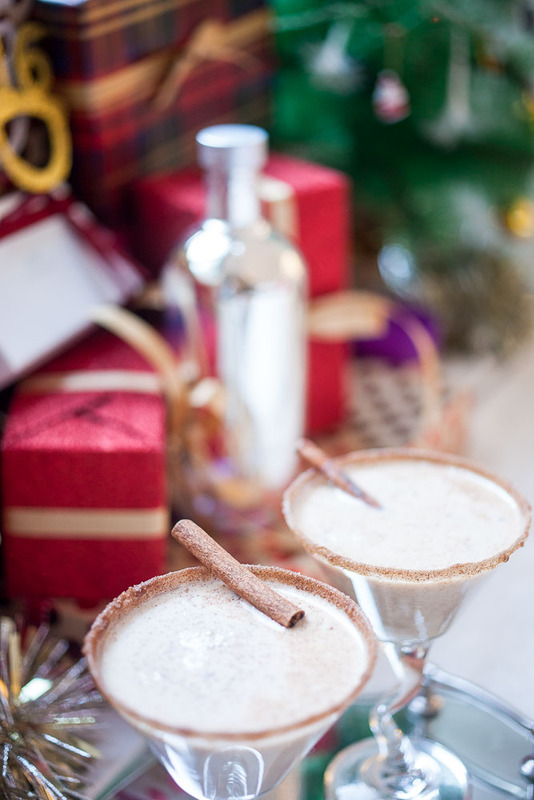 Directions: To start we'll rim the glass with the cinnamon sugar. To do this I just poured the cinnamon sugar into one bowl and maple syrup into the other. Dipped the glasses into the syrup and then into the cinnamon sugar (make sure it's all covered) and wa-la! You're ready to get started. 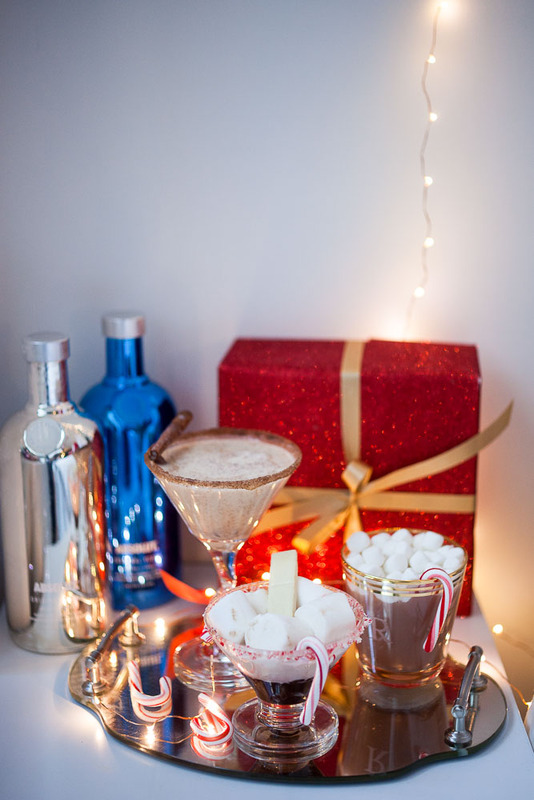 For the drink itself, I poured maple syrup, half and half, cinnamon sugar and a shot of Absolut vodka into a martini shaker and mixed it all together. I didn't really measure it all out but the recipe I worked off of says 3 oz of syrup, 4 oz of half and half and 2 oz of Absolut vodka (this recipe is for two full glasses). 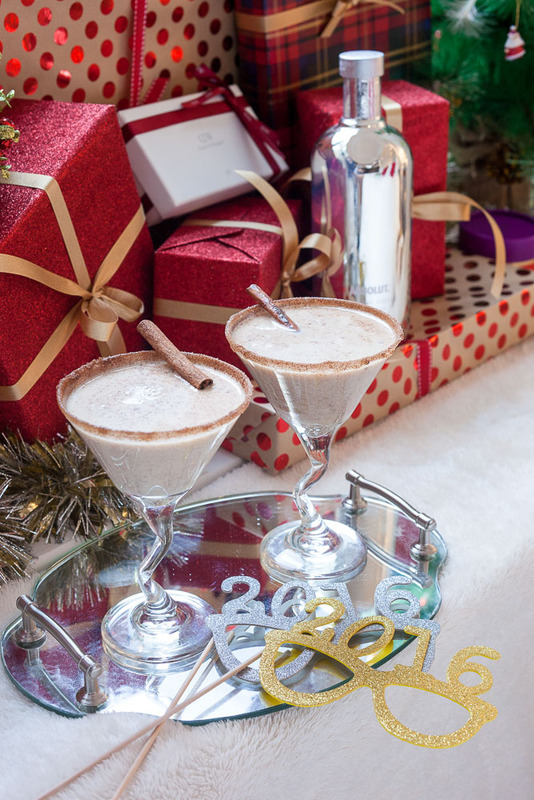 Once it's all blended together, you just pour into your rimmed glasses and add some cinnamon sticks for decor. Directions: This one is pretty easy to make honestly! I threw in a swiss miss k-cup into my brewer, added a shot of Absolut, mixed it together and poured it into my new monogram glasses. 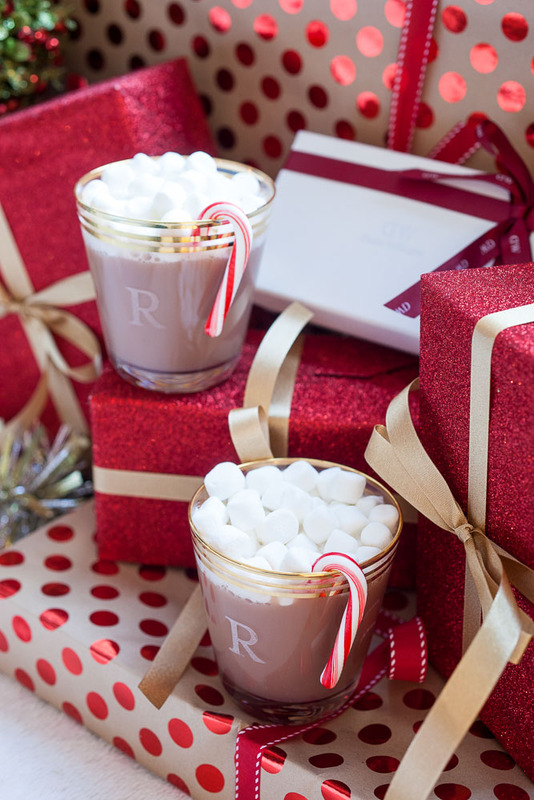 Then of course hot chocolate isn't hot chocolate without some marshmellows. So I topped it off with a hand full of those and to make it a bit festive, added candy canes on the rims! Directions: Out of the three drinks this one took the longest so be sure to leave time for this! 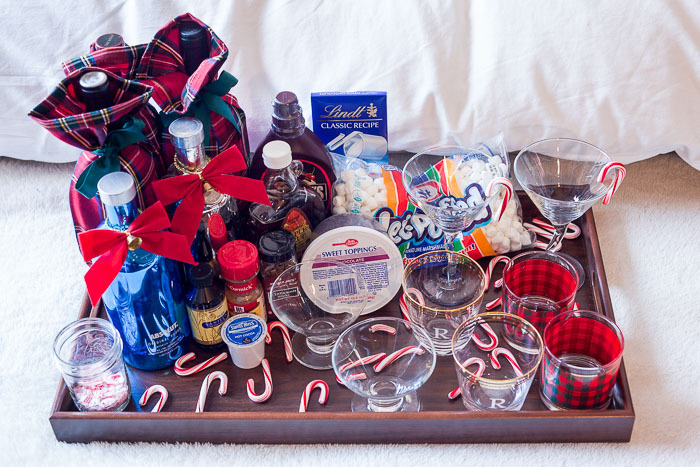 To start, I crushed up a ton of candy canes and split it into two bags. One bag would be poured into a mason jar and then soaked in Absolut vodka for about 30 minutes. The other bag will go into a bowl so we can rim the glasses (like we did for the first drink). After the Absolut vodka is infused, it turns red (which is really fun) and VERY pepperminty! 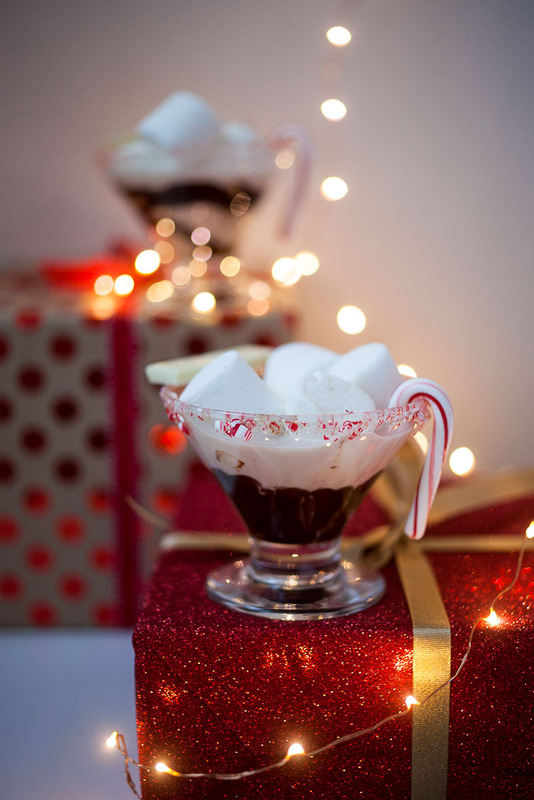 After we rim the glasses with the crushed candy canes, I pour some chocolate syrup into a glass, add half and half, milk and a shot of the peppermint infused Absolut vodka and mix it all up. 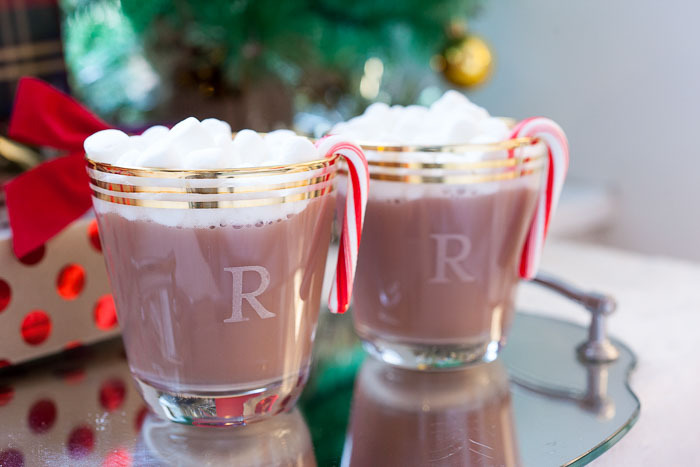 Before I pour it in, I decorate the glass with a little more chocolate syrup and then add in the drink. 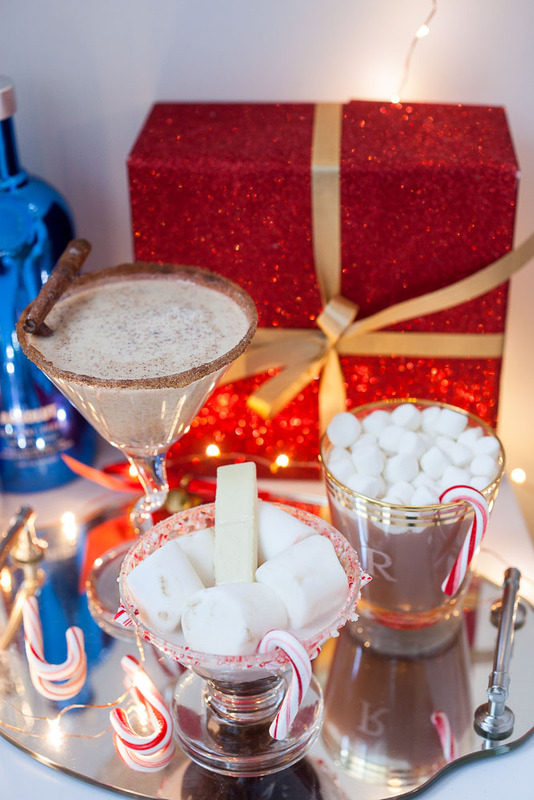 Top it off with some marshmallows (because why not) and white chocolate! 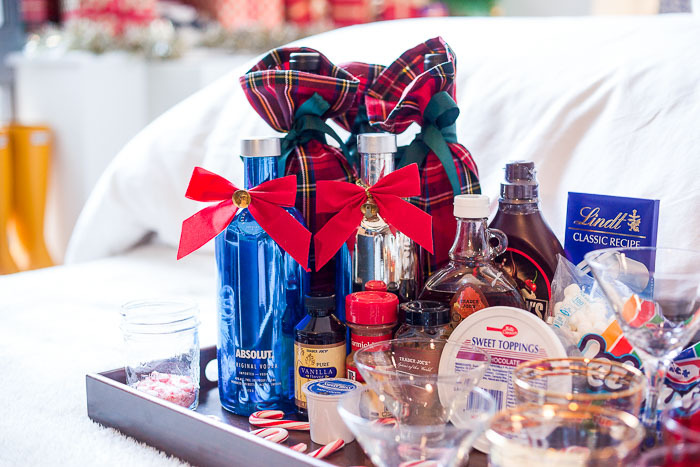 And with that you have yourself the PERFECT trio of holiday drinks for your parties this season. Which one was your favorite? 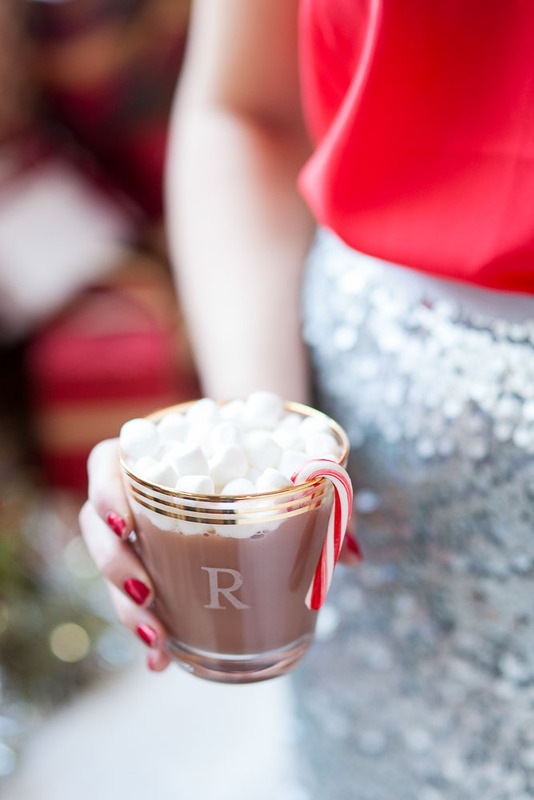 I think mine was the spiked hot chocolate. It was sooo yummy! And not going to lie, I ate a TON of marshmellows in the making of the blog post. Whether you're hosting a party this season or just joining some, make to check out Hoppr, a mobile site launched by Absolut. It helps invite people to your parties and also invites YOU to parties in your neighborhood in NYC. It's always fun to meet new people and especially in the city, there is no limit to new friends! But be sure to always drink responsibly. 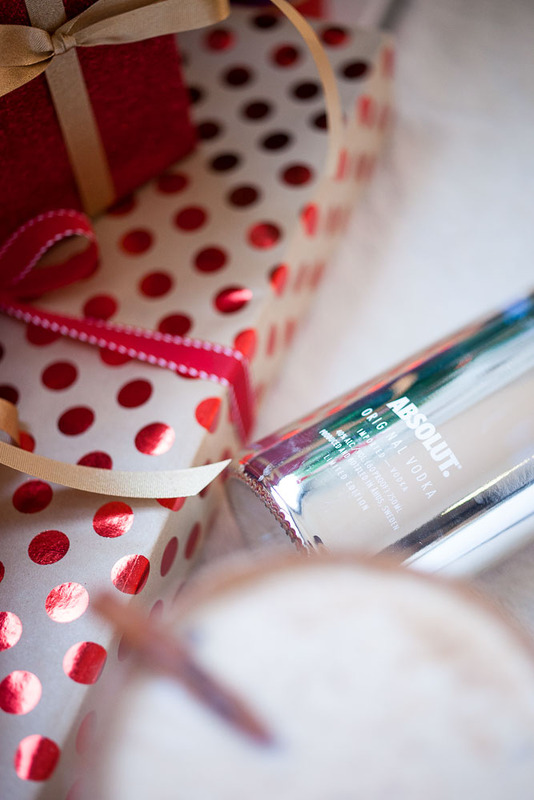 Big thanks to Absolut for sponsoring this post! I love Absolut's shiny bottles! So festive! I know it's very basic but vanilla Absolut and Sprite is to die for! Yum!